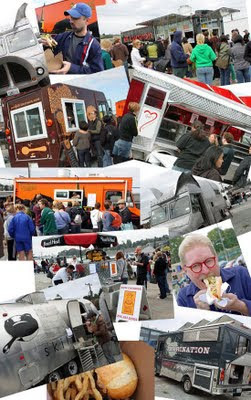 Yesterday was the Mobile Chowdown at Interbay. This was the first, of I hope many, street food vendor gatherings in Seattle. The street food vendors included Skillet, Maximus Minimus, Marination Station, Gert's BBQ, Parfait Organic Ice Cream, El Camion, Dante's Inferno Dogs, and Kaosamai Thai. I had the pleasure of attending this event with my best friends Shay, Penny & Scott. The event started at 11:00am and was scheduled to go until 3:00pm, or until they ran out of food. I'm pretty sure all the vendors ran out of food before the 3:00pm deadline. When we arrived shortly after 12:00pm, there were already long lines snaking from each vendors' trailers. I'm not sure the organizers of the event nor the vendors themselves expected shuch a large turnout for the event. Seattlites love their street food! When we approached the crowd of people it was hard to determine where any of the lines ended for any of the vendors. All the lines seemed to all be blended together. So we just stood behind some people who looked like they were in line and hoped it led us to some good food. As we slowly advanced through the line, we found out that we were in line for Skillet. This was good news as I have always wanted to try their food. When we approached the Skillet airstream trailer, we were able to get a glimpse of their menu offerings, which just so happen to be written on the side of the airstream trailer with a black marker. Shay and I chose to go with the Skillet Burger and French Fries. Penny selected the Thai Chile Burger. Now I must say, I love hamburgers and I have had my share of bad burgers and great burgers. I would have to say that the Skillet Burger was by far one of the best burgers I have ever tasted! The hour and a half wait was well worth it! The Skillet Burger isn't just a burger, it's an experience. It consists of grass fed beef grilled and topped with bacon jam (yes, bacon jam!! ), arugula, cambazola and served on a butter toasted macrina soft roll. The hand-cut french fries were tasty too! Shay agreed with me that the Skillet Burger was very good. Penny also really enjoyed her Thai Chile Burger. If you haven't checked out Skillet yet, do it! They have a weekly calender on their website of where the airstream trailer will be located. Scott decided to try out Dante's Inferno Dogs and he seemed to really enjoy their hot dogs. I would have loved to have tried out some of the other vendors food, but waiting another hour or longer in line didn't seem like all that much fun. Although after seeing some people walking around with the Parfait Organic Ice Cream, it was very tempting. This event was a huge success. I'm sure this will become an annual event. There's already a rumor that next year they will offer a beer garden and live music. I'm guessing next year there will be even more street food vendors participating. This event was sponsored by Seattle Magazine, Sorrento Hotel and Tilth Restaurant. See....isn't that Skillet burger the best? It's the bacon jam that pulls it all together. You're lucky you were able to make it out there. If I wasn't working, I would have been there. Nice collage of pics and commentary.